It might have been somewhat overshadowed by the country’s defeat in the football World Cup final that took place days before, but the IPO of Argentina’s software development powerhouse Globant has been a solid success so far. The float of the company on the New York Stock Exchange was a totemic moment for the Argentine tech economy and with a market capitalisation of over $371m as this article was being written, Globant, as its name suggests, is establishing itself on the global stage. What is most striking about Globant, perhaps, is that it is not exclusively, or even principally, focused on local economies and its biggest markets are the US and the UK. It also differentiates itself from mainstream software development competition by having a reputation for being at the cutting edge, dividing itself into 12 ‘Studios’ that include Enterprise Consumerization, Creative and Social and Wearables & Internet of Things. The Studios also include the quartet of hot activities sometimes dubbed SoCloMoDa: social, cloud, mobile and Big Data. Growth has been impressive in just 11 years of operations with 2013 turnover of $158m and a headcount of 3,300. That rise has come on the back of a blend of acquisitions and organic growth but innovation has been a common theme and customers have included some of the biggest brands on the planet, including Disney, Coca-Cola, Electronic Arts, Google, Zynga and LinkedIn. Reid Hoffman, co-founder of LinkedIn, sits on Globant’s board. That success has even earned Globant academic interest with Harvard, MIT and Stanford publishing studies of the company while in March 2010, Gartner named it as one of its “Cool Vendors”. In early 2013, media and advertising giant WPP bought a 20% stake in the firm. 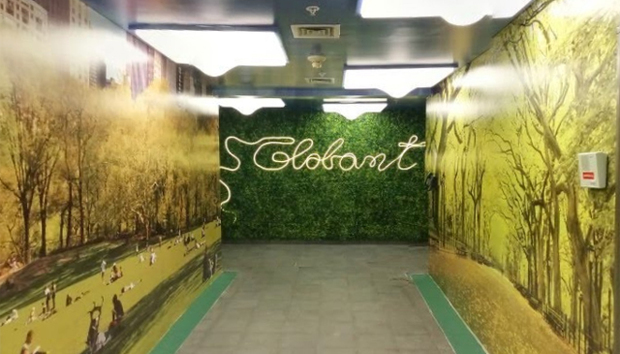 That points to an opportunity for Globant: as more advertising and communications organisations seek to create differentiated content and user experiences, firms like Globant that focus on the latest and greatest technologies stand to gain. In the Attention Economy, that could be a valuable high-end focus. In contrast to the old consulting giants, Globant encourages staff to learn new skills in new areas. Rather like a boutique media agency, employees have their own tribal designation (‘Globers’) and work in trendy workspaces purpose-built to encourage interaction, collaboration and teamwork. Pictures on its website show a fraternal, college-like atmosphere that could be plucked from the pages of any trendy Californian tech firm. That Valley-like character is also clear from its positioning statements. Globant says it has six core values: Act Ethically; Be a Team Player; Constantly Innovate, Aim For Excellence; Think Big; and Have Fun. In this sense it more resembles an internet company like Google or a small US consulting company like Bluewolf rather than an Accenture or one of the heavyweight Indian BPO players. Argentina has long had strong skills in software but this has been disguised by major problems with its economy. Floating on the ‘Big Board’ might well draw attention to other hot Argentine companies, most notably MercadoLibre, which is to some extent a Latin American equivalent to Amazon.com and eBay. Globant might also be representative of how far companies from outside the major tech centres can go. Globalisation is often used as a watchword symbiotically joined to technology but the US remains a dominant force. If Argentina can follow the likes of India and Israel in creating world-class software development houses, it might give rise to a host of followers in its own country and around the world. The Week in Mac Accessories: Carry on!